Sometimes, if you're not paying close attention, the sky can play tricks on you. For the past couple of months, Jupiter has been a prominent object in the southwestern sky just after sunset, what some would call "the evening star." On Feb. 16 there will be a celestial "bait and switch" as Venus replaces Jupiter as the evening star. Because Earth moves much faster around the sun than Jupiter does, Jupiter appears to move ever-so-slowly from left to right relative to the sun, as seen in the Northern Hemisphere. One can see this effect over the course of a few nights by noting Jupiter's position at the same time each night. Jupiter has been sinking towards the sun night by night over the past two months. Venus is closer to the sun than the Earth. It passed behind the sun on Jan. 11, from our point of view, and now is moving from right to left relative to the sun towards greatest eastern elongation on Aug. 20 – that's when it'll be farthest out to the side, forming a triangle with Earth and the sun as seen from above, and that's when Venus will appear highest in our sky. On the evening of Tuesday, Feb. 16, from our vantage point, Jupiter (moving left to right) will pass Venus (moving right to left). The two planets will appear to be separated from each other by an amount equal to the diameter of our moon in the sky. Even though Venus is much smaller in diameter than Jupiter, it will be very much brighter to the eye because it is much closer to the sun and to Earth than Jupiter. 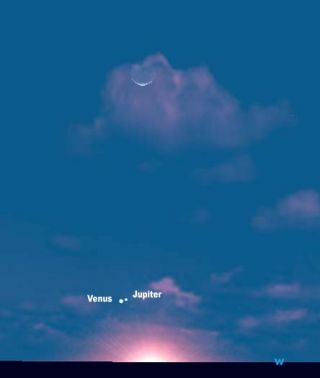 On Feb. 16, Venus and Jupiter will easily fit in the field of a small telescope. Jupiter will appear more than three times the size of Venus, a brooding giant far beyond brilliant Venus. Try to follow the action over the next week as the two planets rapidly approach each other. After Feb. 16, Jupiter will be gone behind the sun for the next month, emerging as a "morning star" late in March. Venus gradually gets farther from the sun and more brilliant, reaching greatest eastern elongation on Aug. 20 and greatest brilliancy on Sept. 23, before passing between Earth and sun on Oct. 29.